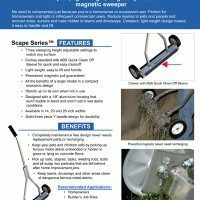 The Scape is a compact, light weight, push type magnetic sweeper. 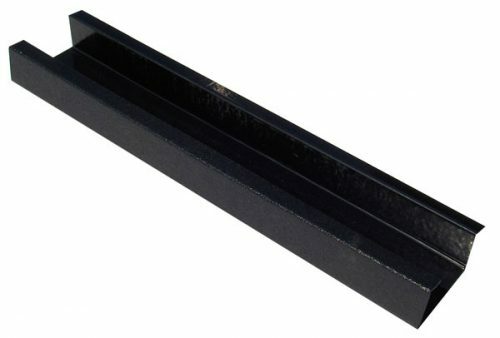 In addition to being perfect for home owners and light users, the Scape is also a favorite of roofers who want a light weight but effective tool. The Scape is light enough to easily pick up by one side of the lower “Y handle and hold over a bin with one hand while you snap the Quick Clean Off Sleeve off. Once cleaned off the sleeve pops back on very quickly and easily and you’re ready to go again. The Scape also fits nicely behind the seat of a pickup truck. Maximum lifting height of 3 ¾” using a two and a half inch nail. Easy Quick Clean Off Sleeve! 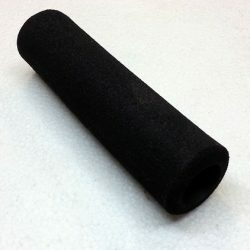 Durable PVC Quick Clean Off Sleeve makes cleaning off debris from the sweeper fast and easy. "The guys are telling me the Scape 26 magnetic sweeper works great!! The order went smoothly and all is well." 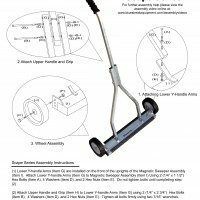 Light weight, easy to lift and handle, magnetic sweeper. No need to compromise just because you’re a homeowner or occasional user. 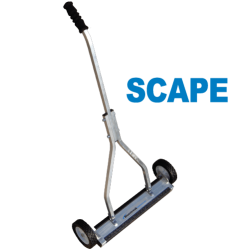 The Scape is a light weight easy to handle magnetic sweeper. It also comes standard with features such as a Quick Clean Off Sleeve, height adjustability, and “Wrap Around” feature. The maximum lifting height for the sweeper is 3 and 3/4 inches. 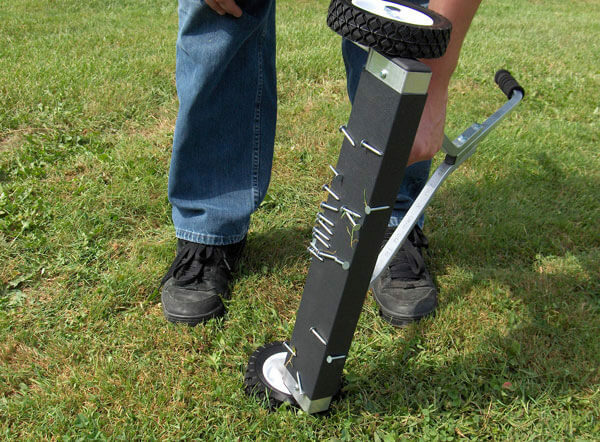 “Wrap Around” feature designed for pushing the magnetic sweeper through grass. The “Wrap Around” feature prevents debris from being brushed off by grass once picked. The debris just wraps around onto the back side of the magnet instead. 3 wheel height settings to adjust the sweeping height from 7/8″ to 2 and 1/8″ to accommodate any situation. Height adjustment allows fine tuning of performance on a variety of terrains and conditions for optimum performance. Durable PVC Quick Clean Off Sleeve wraps around sweeper to speed up removal of debris from the sweeper. Just pop the sleeve off over a bin to remove debris and then snap it back onto the sweeper. The Sleeve also helps protect the sweeper housing. 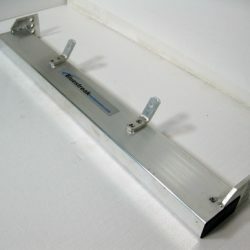 Durable and long lasting all weather aluminum housing construction won’t rust or deteriorate in wet, damp, conditions. Permanently charged magnets. No replacement or recharging necessary. Sweeping height adjustment. Three adjustment settings to handle any sweeping surface. Available in 3 sizes; 14", 20" and 26". Solid "Y" handle design, the same as the more expensive models. Control the sweeping height with 3 wheel height settings to accommodate any situation. Durable and long lasting all weather aluminum housing construction won’t rust or deteriorate in wet, damp conditions. Stands upright on its own when not in use, so no stooping over to pick it up all the time and reduces risk of having it accidentally run over by a vehicle. Quick Clean Off Sleeve makes cleaning off debris fast and easy. Comes standard with the Scape Series. 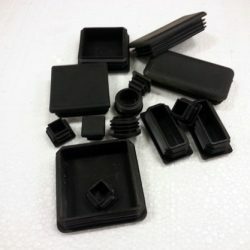 Made of durable PVC. I received my order Thursday, 5/17. I was hopeful that what I viewed online on your web site would be what I received. Not being able to view in-person is always a concern. I was not disappointed. I searched for days to locate a product that was well made. Unfortunately, anything I found stateside did not offer this degree of quality. Quality does not come cheap, but the shipping and brokerage charge hurt somewhat. The alternative was to buy cheap and suffer the frustration of poor quality and that I cannot tolerate. 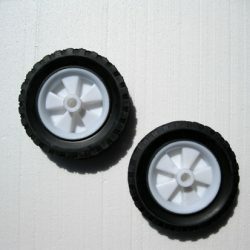 The ground around my home is a bit rough so I set the wheels at the highest position. What prompted this purchase was a recent removal of shingles and new shingles applied, a reroofing job. The Central Machinery magnetic sweeper the crew had at their disposal was not to my liking. I used it and was disappointed at how it picked up nails only to see some wiped off by the grass. I knew they would not have the time to do a thorough job and that concerned me greatly. I could see in the offing nails in my vehicle and riding mower tires, not to mention the possibility of shoes and bare feet if children were to visit. Metal debris and nails are also a concern regarding pets and possibly animals roaming nearby out here in the boondocks. As soon as the rain ceases and the grass dries, I will put to the test both units. I will post my comments regarding how well they performed upon a later date. I noticed too much play between the wheel and the wheel housing bracket. I chose to place a steel washer, lacking a brass washer of that size, on either side of the wheel to minimize wear to the wheel hubs. Oh, I almost forgot to mention how nice it was to see a manufacturer to include cut flat washers for the bolts and nuts. It gripes me to no end to see how quality has suffered over the decades. It is an inspiration to see quality and consciousness are not lost on Mike Holmes and the skilled craftsmen he uses on his show, a quality that is in short supply in the US. Your company is part of that heritage. Finally, regarding shipping, one of the end caps on the Scape covering the opening to the ceramic magnetic had popped out from rough handling during shipping. I would suggest a wooden block at either end to avoid sudden shifting and secure tightly the unit. I have seen from experience how freight is handled from working at ACE Hardware Stores and unloading of merchandise from semitrailers. Your shipping carton showed much abuse. The PowerStick carton was in a much better condition. The guys are telling me the Scape 26 magnetic sweeper works great!! The order went smoothly and all is well.